No. Not in absolute dollar amount nor, most importantly, as a percentage of bond mutual fund assets. Based on ICI’s weekly mutual fund flows report published December 19, bond mutual funds have had 10 consecutive weeks of outflows, totaling an estimated $79 billion dollars. Such numbers naturally draw attention, especially when they’re reported without any context. But when put in the appropriate context—the outflows’ share of the total assets in bond mutual funds—the numbers lose much of their click-bait appeal. As Figure 1 shows, the recent $79 billion outflow represents just 1.9 percent of the $4.2 trillion in bond mutual funds as of September 2018 (before the start of the outflows). In addition, bond mutual funds had multiple weeks of sustained outflows in other periods (2008, 2013, 2015, and 2016). What’s noticeable is that in each of these periods, the cumulative outflows amounted to a small share of bond fund assets. Even during the longest and largest period of outflows from bond mutual funds (31 weeks from June 5 to December 31, 2013), the $168 billion in outflows represented only 4.8 percent of bond fund assets at the time. Focusing on outflows in dollar terms fuels stories—and regulator concerns—about investors “fleeing” bond funds, with associated hand-wringing about funds’ liquidity, “first mover” advantages, and “runs.” But isn’t the bigger story here the fact that investors decided to keep 98 percent of bond mutual fund assets invested as they ride out a bumpy market because these investors have long-term goals that bond funds help them achieve? 1 Cumulative outflow over the period as a percentage of bond mutual fund assets at the month-end prior to the start of the period of net redemptions. 2 Data contain two one-week periods with small inflows. The media and regulators often presume that outflows will force bond fund managers to sell portfolio assets to meet redemptions, pushing bond prices even lower and setting up a “vicious cycle” of falling prices and further sales. We’ve shown in many contexts that these “fire sale” assumptions don’t stand up to data and evidence. The facts are that bond mutual fund managers have a variety of tools to meet redemptions—and sometimes view declines in bond prices as buying opportunities. Recent experience reinforces that message. According to ICI’s monthly Trends in Mutual Fund Investing release, bond mutual funds in October 2018 reported outflows of $32 billion, or 0.8 percent of September bond fund assets—the first monthly aggregate outflow for bond mutual funds since December 2016. The Federal Reserve in October was indicating that monetary policy might need to be tightened more aggressively. The yield on the 10-year Treasury note, which had broken through 3 percent in September, was continuing to march upward. That, combined with the potential for a looming trade war, boosted stock market volatility. Faced with redemption requests, were bond mutual fund managers forced to sell bonds? No. Bond mutual funds were net buyers of bonds in October. 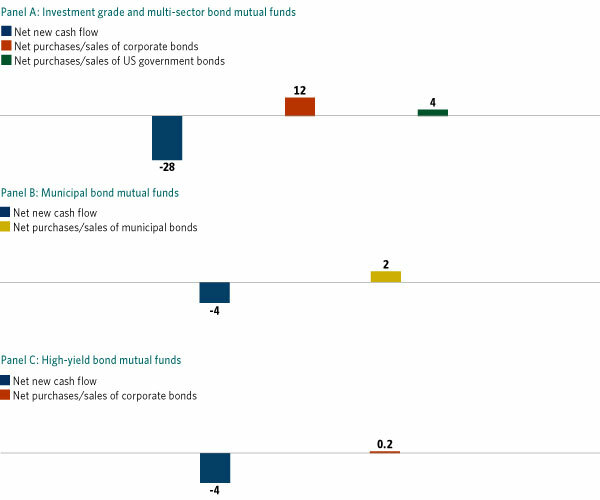 As Figure 2 shows, despite outflows, all different types of bond funds were buying on net. For example, although investment grade and multisector bond mutual funds (Panel A) had $28 billion in outflows in October, these funds collectively purchased, on net, $12 billion in corporate bonds and $4 billion in US government bonds. Municipal bond funds (Panel B) also were net buyers of municipal bonds despite outflows. High-yield bond mutual funds (Panel C), which are often scrutinized by regulators and the financial press, purchased, on net, a small amount of corporate bonds, and their holdings of government bonds (not shown) were essentially unchanged. Fire Sale? What Fire Sale? Bond fund managers have many ways to meet redemption requests other than selling bonds. For example, in any given month, mutual funds receive cash as the bonds they hold either pay interest or mature. These cash sources often can fulfill the vast majority of redemption requests. In addition, bond fund managers hold short-term assets or use derivatives to manage their liquidity and prepare to meet redemptions. As noted above, outflows from bond mutual funds have continued through November and early December. We don’t yet have data on bond funds’ purchases and sales of bonds in those months—and it’s quite possible that these funds could have been net sellers. But that’s a question to be settled by data—not by the simple assumption that outflows from bond funds will immediately spill over and damage the underlying bond markets.